These patriotic kids crafts would be great to make for Memorial Day, Veteran’s Day, or the 4th of July. 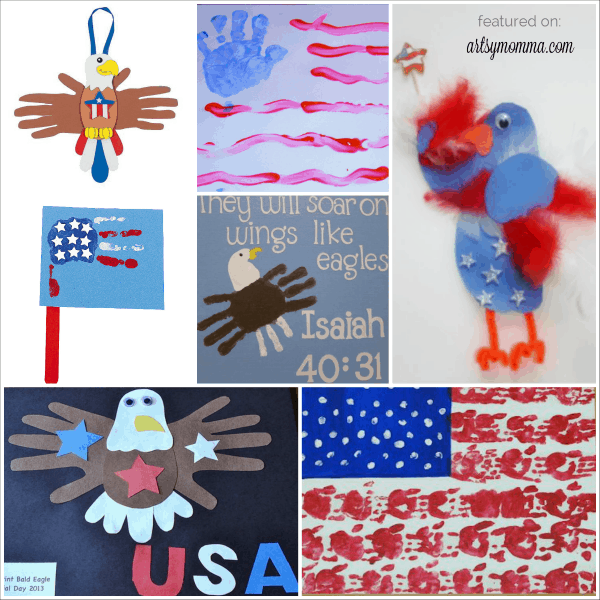 Featured below are handprint American Flags and a couple handprint eagle crafts. Author Debbie Clement has a great round up of school crafts from her travels which you can see over on her blog, Rainbows Within Reach. I love this Young hands working together Handprint American Flag. United We Stand Handprint Flag – Crissy Crafts, Love when she made it her profile picture on Facebook last year! This simple and cute Fingerpainted American Flag from A Little Tipsy is great for toddlers as well as older kids. Oriental Trading Company always has the cutest handprint kits. This Patriotic Flag Craft Kit and Patriotic Eagle Craft Kits are perfect as a school craft or playgroup activity! The Virtual Vine has an entire lesson plan. My favorite is the United We Stand Handprint Craft. 4th of July Handprint & Footprint Crafts – Another round up we did featuring fireworks, flags, and eagles. All American Bird Footprint Craft is from Crafty Noodle. The link has a redirect on it currently so will update when it is fixed. This Handprint Eagle and Saying would be great to hang up as decor. I love this Bald Eagle Craft! No instructions but is easy enough to figure out. We have tons of Patriotic Themed Crafts for Kids saved on our Pinterest board! these are really cute, I may do the hand print ones with my 3 year old this weekend. Thanks! I love your blog. My kids are all teens but I still pop in here and am always amazed at your post. I would LOVE for you to pop over and link this up in my Red White and Blue linky! It would be fun having you! I did the eagles with a white foot print (body) and then the brown hands(wings). It turned out super cute and I took a picture of it!